Center for Health Progress has been hard at work since 1997. Center for Health Progress, formerly known as the Colorado Coalition for the Medically Underserved, was founded in 1997 as part of the Colorado Medical Society. In 2017, we changed our name to better reflect our mission and commitment to action and collaboration; however, our core values remain the same. Since our founding, Center for Health Progress has been a home for those who are passionate about and dedicated to creating justice and equity in our health care system. For all that have been a part of our work and share our vision for a healthier state, thank you–we invite you to continue the journey with us until we reach our shared vision of a healthier, more equitable Colorado. Caring for Colorado’s Medically Underserved – Under the leadership of Gary VanderArk, MD, our founder, this conference launched the Colorado Coalition for the Medically Underserved into existence as part of the Colorado Medical Society. It has continued on as an annual event, attended by hundreds each year. “A Plan for Colorado: Meeting the Needs of the Medically Underserved” – This report was a roadmap for achieving the vision of access to affordable, quality health care, and preventative care programs. Child Health Plan Plus (CHP+) – CHP+ becomes an important coverage option in Colorado for children and pregnant women whose families make too much for Medicaid, but still cannot afford private insurance. Community Development Subcommittee – This committee was formed to foster collaboration between the general public and provider community. “Organizing Your Community to Improve Health” – This guidebook for communities was designed to help them meet the needs of the medically underserved. “Healthy Colorado Now!” Tour – This ambitious statewide tour of 20 town halls let us hear from over 1,000 people on how to best provide health care coverage and access for every Coloradan. Legislative Subcommittee – The Health Policy Committee allowed us to focus on relevant legislation and other policy developments. Nonprofit Incorporation – Incorporation as a 501(c)(3) nonprofit allowed us to move beyond research and analysis into action. Caring for Colorado’s Medically Underserved – Although this conference was held every year, in 2003, it was a partnership with the Robert Wood Johnson Foundation that drew an extra large crowd of nearly 500. Streamlining Colorado’s Health Care System – These conferences brought together current leaders to discuss how to improve Colorado’s health care system. Amendment 35 / Colorado Tobacco Tax Act – This act brought critical new resources to support health promotion, disease prevention, public coverage, and primary care access. Office Space – We moved into our first permanent location in downtown Denver, gifted to us by Central Presbyterian. Blue Ribbon Commission for Health Care Reform – This bipartisan commission established under Governor Bill Ritter’s administration sets into motion early ideas for health care reform in Colorado, many of which are in place today. 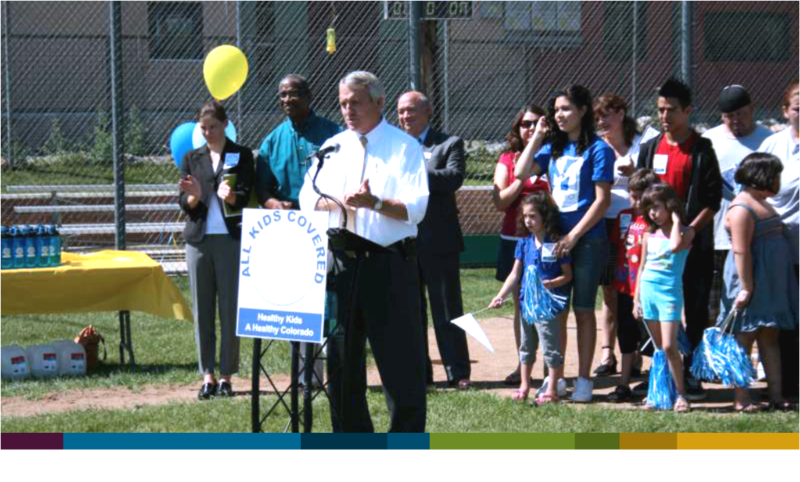 All Kids Covered – This collaborative began working to help pass legislation. It remains our main conduit for child-related policy work. KidBlitz – This program was created as a volunteer-based effort to help families learn about and enroll in Medicaid & CHP+. Colorado Health Care Affordability Act – This act, also known as the hospital provider fee bill, included key expansions in coverage for Coloradans and support for the health care safety net. Aurora Health Access – We helped found this community coalition which aims to improve Aurora’s health care system. Colorado HealthStory – Originally initiated through a three-organization partnership and later managed solely by us, this project, modeled off NPR’s StoryCorps Project, aimed to bring communities together around shared stories of health. Patient Protection and Affordable Care Act – The Affordable Care Act is signed into law, which is federal legislation in alignment with Colorado’s already ongoing health reforms further propels (and funds) Colorado’s progress. Senate Bill 200 – This bill created the Colorado Health Benefit Exchange. Our Executive Director was appointed to the Board and had a hand in founding the exchange for Coloradans to shop and purchase private insurance plans. Connect to Coverage, Connect to Care Campaign – We led this group to assist with implementation of the Medicaid expansion to low-income adults. This project concluded in March 2014, after achieving our vision of a successful launch of this important coverage for many. Colorado Network of Health Alliances – We formed this group, made up of health alliances around the state, to increase the capacity, visibility, and efficiency of their collective work. 15-Year Anniversary – We celebrated fifteen years of serving Colorado with a new website, logo, and a gathering of all our supporters from throughout the years. Senate Bill 200 – This bill expanded Medicaid in accordance with federal law to all Coloradans with incomes below 133% federal poverty level (FPL). Senate Bill 242 – This bill added an adult dental benefit to Medicaid, increasing access to oral health care. Insuring Our Future – We were part of the leadership team of this group, who came together in support of Medicaid. “Video: The Art of Health Care” – This video, illustrating the social determinants of health in a clinical setting, broadened our health equity work. Health Perspectives Infographic Series – This award-winning series illustrating health from the perspectives of several different populations increased awareness of health inequities. Senate Bill 144 – This bill created more residency slots in rural and underserved areas, increasing access in underserved areas of our state. Senate Bill 187 – This bill created a 12-member bipartisan and diverse commission to analyze and make recommendations on addressing key cost drivers in health care. Health is Local – This project followed four communities (Summit, Yuma, Montrose counties, and the city of Colorado Springs) through the first year of health reform implementation, in order to report on its impact and how each community approached implementation differently. State Innovation Model Grant – Colorado was awarded a $65 million federal grant, an application process we participated in, to integrate primary care and behavioral health. We would later become active in engaging consumers who will be trained to share their own perspectives on needed health systems changes. Medicaid Expansion – Colorado officially extends full Medicaid coverage to adults without dependent children up to the federal poverty level for the first time. Colorado Access to Care Index – We worked in partnership with Colorado Health Institute to create the first-ever statewide Access to Care Index, measuring and tracking the ability of Coloradans to access needed health care services. House Bill 1097 – This bill improves the process in which providers of Non-Emergent Medical Transportation are approved to contract with Medicaid, which helps patients who need transportation to visit their doctor. Senate Bill 69 – This bill makes it possible for Colorado to recognize community paramedics and their agencies as providers of on-site, low-acuity care, in order to reduce unnecessary ER visits and hospital readmissions. We worked for two years on this process, bringing together stakeholders and identifying common ground. 20-Year Anniversary – Upon celebration of 20 years of our organization’s existence, we transitioned to a new name and a new look. Waiting for Health Equity – We released our graphic novel, highlighting the root causes of health inequities. Community Organizing – We launched a grassroots organizing program, with organizers in Pueblo and Fort Morgan, to develop leaders and empower Coloradans experiencing the greatest health inequities to advocate for themselves. EquityLab – We launched a leadership program for health system executives that want to become champions for health equity within their organizations. The first cohort of leaders were chosen from a group of applicants for a two-year training and coaching experience. Senate Bill 108 – This bill expands access to driver’s licenses for Colorado’s immigrants that lack documentation. It will make it easier for these families to get to school, work, grocery stores, doctor’s offices and the many other locations that promote better health. We worked with immigrant rights advocates over two years to help pass this legislation. Morgan Health Connectors – We brought together a dozen immigrant women in Fort Morgan to build their leadership and support their advocacy toward improving their local health care system. They’ll be hosting educational events and working toward policy change in the coming years. The Future – We’ve got big plans for the years ahead! We hope you’ll join us in our march toward health equity!